This simple nutrition regimen took away Chris Whited's frustration in the kitchen. He kept his meals simple and changed his body forever. 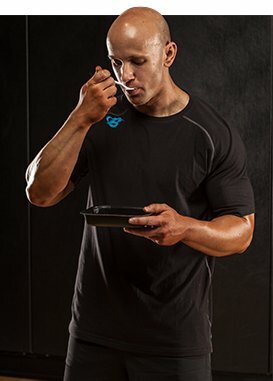 Bodybuilders catch flak for their insistence on eating chicken and vegetables, even though they find thousands of neat ways to enliven their staple meal. Chris Whited wasn&apos;t concerned with variation during his pursuit of the 2013 $100,000 Transformation Challenge. He stuck to the basics and found amazing results. This plan may or may not work for your lifestyle. It&apos;s clean and simple. Use it to commence your own fitness quest. You may not win $100,000, but you can make a difference in your life. Chris changed because he saw his children and wanted to be there for them. Whatever your motivation, use Chris as an example of how consistency leads to results. Once Chris got a handle on his nutrition, he began to lose weight. He&apos;d been lifting sporadically for years, even through his physical decline, but without proper guidance in the kitchen, he packed on so much extra weight that his clothes failed to fit. For the $100,000 Transformation Challenge, he couldn&apos;t take anything for granted. He renewed his food focus and won the contest. "Nutrition is the most important part if you are doing a challenge like this," Whited says. "I&apos;d say it&apos;s 80 percent. You gotta get your nutrition down." Modern convenience makes dieting hard. You can stop at 30 different places on your way home and get dinner in a hurry. But modern science also makes fit eating easier. Chris ate chicken and vegetable "steamers" two or three times each day, cooked in the microwave and served before any urges kicked in. It&apos;s not fancy, but he stuck to it. "Nutrition is the most important part if you are doing a challenge like this." "People can overanalyze things and get burned out in the first week," Chris says. "I approached it casually. It&apos;s a lot easier than it was 10-20 years ago. They have healthy foods you can just pop in the microwave and eat. I thought: If I can get this right, if I start doing this, then it&apos;s all going to come out good in the end." Chris slowly cut down on his carbohydrates as the 12-week challenge wore on. He eventually cut out an entire whole meal. About halfway through his transformation, Chris learned how to make his own meals ahead of time. He became a better cook and left the microwave for a conventional oven. He developed a routine—a healthy habit—and it stuck. He ate 3-4 whole meals per day, then added 3 protein shakes. That&apos;s 6-7 meals, spaced out every 2-3 hours. He cut out soda, his bane, and drank water exclusively. He cut out cookies and dinners at restaurants. At home it was easy, but with friends in town and weekend parties, he had to be careful. "You can slip really quick," Chris says. "It was really hard at the first part of the challenge, but as it progressed, it got easier." The program below is simple, and you&apos;ve probably seen some iteration of it in the past. Why is that? Because this simple program, combined with a solid supplement regimen and workout plan, has worked for Chris and thousands of trainees who came before him. Try it on for size.